I Love You More Than Carrots: Double Chocolate Junior Minties :: Hey, That's Pin-tastic! 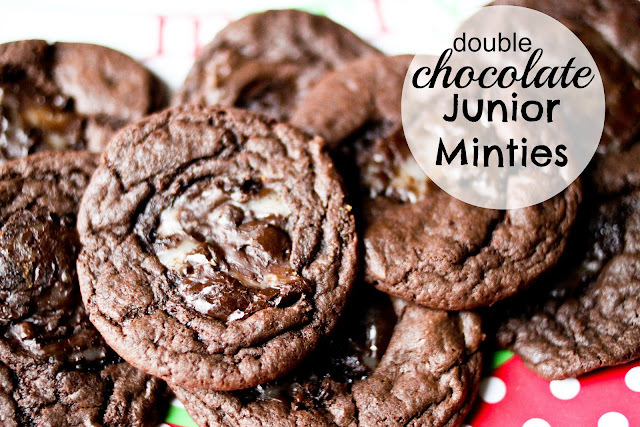 Double Chocolate Junior Minties :: Hey, That's Pin-tastic! Having just hosted my husband's family for our annual Christmas dinner on Saturday, I had a tough time choosing which recipe I would share for this week's installment of Hey, That's Pin-tastic! 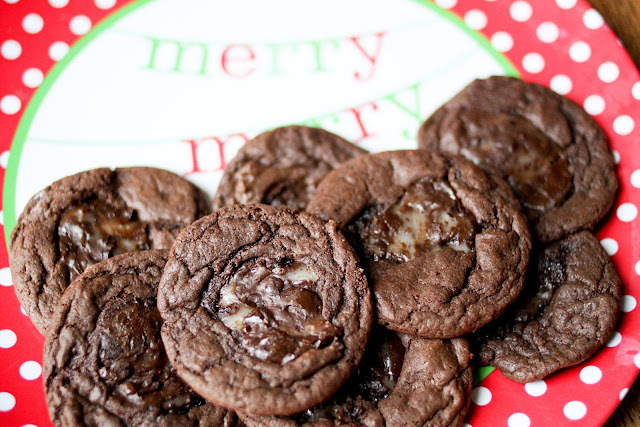 A baker and sweets-lover at heart, this recipe was too good not to share and with the countless Cookie Swaps often brought about during the Christmas season, I knew it would be the perfect recipe to whip up. I've made these cookies a few times now and at the request of my brother-in-law, mother-in-law and husband (yes, they're that good), I set to baking them again this year for our annual cookie swap. The ingredients are simple and the instructions, easy. Each year I tweak the recipe and cooking time just a bit and I think I've finally perfected it! Mix cake mix, oil and eggs together in a large mixing bowl. Drop tablespoon-sized spoonfuls of dough onto a baking sheet lined with parchment paper. Bake for 5 minutes and remove from oven. Place two Junior Mints onto the center of each, pressing down gently. Replace cookie sheet in oven and bake for an additional 2 minutes. Once finished, remove cookies from oven and use a toothpick or small butter knife to spread or "swirl" the melted Junior Mint. Remove cookies from baking sheet and allow to cool slightly. These cookies are absolutely delicious when still warm but even once they've cooled and set they are still deliciously chewy and gooey. this recipe has been adapted from a similar one found here. Welcome to week 14 of Hey, That's Pin-tastic, the weekly link-up posted every Monday where I encourage you to pick one pin you've pinned and either "make, bake, decorate or create" it! Most importantly, this link-up is to get you to DO the pins you've been pinning! Be sure to grab the official "Hey, That's Pin-tastic" button and embed it in your post. You'll need to highlight the grab code and use your keyboard shortcut keys (Control + C) to copy it to your clipboard. Paste the code into your post and be sure to come back here and link-up! All posts bearing the button or a link back to ILYMTC will be pinned to the "Hey, That's Pin-tastic" pin board with over 2,800 followers! I cannot wait to see what you all have been pinning and doing this holiday season! Thanks so much for reading and for linking up! Chocolate with junior mints? Sounds like my kinda heaven! I just ate our entire box of junior mints... not kidding, Darn! Oh my goodness, these sound fantastic! Or should I say pin-tastic! Hehehehe. Thanks for hosting this every week, I have never been so productive! I just made these.. I think they are the gooiest cookie I've EVER had! Thanks for sharing! Thought I should add too... It made 6 dozen for me (the recipe says 3 dozen).. I scooped them with a tablespoon. Hallmark Holiday Card Pack :: Review & Giveaway! The Ladies Behind The $1000 Cash Giveaway. I'm Going To Die Tired. Dear Santa, I Hope You Have A Pinterest Account. All I Want For Christmas Is... $1000 CASH!